The six environmental challenges are listed below, followed by a detailed description of how Toyota plans to implement the second challenge by 2050. Click on any of the further links to be taken to separate posts describing how each challenge will be implemented. Toyota has challenged itself to reduce to zero all CO2 emissions produced throughout the entire life cycle of its cars. 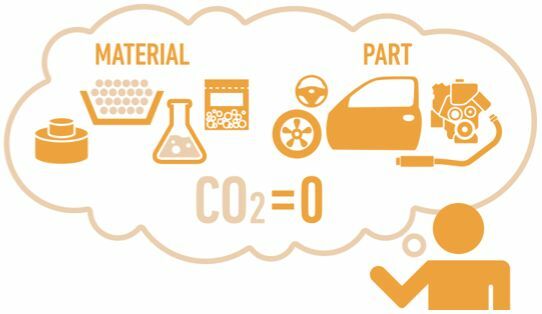 That not only includes emissions produced in travelling and manufacturing but in every potential CO2-emitting process, from materials production to the vehicle’s eventual disposal and recycling. 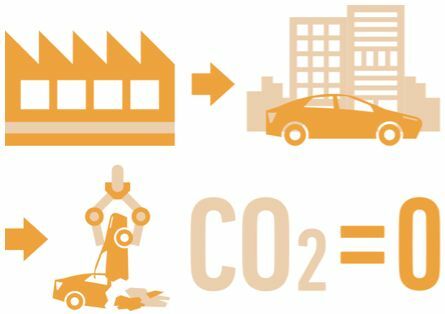 Some next-generation, low-emission vehicles achieve the desired reduction in CO2 emissions when driven but actually generate higher-than-normal emissions at the material and vehicle production stages. All new Toyota vehicles are now planned and developed through the Eco-Vehicle Assessment System (Eco-VAS), a programme that performs a comprehensive environmental impact assessment of any proposed project. By taking into consideration the entire life cycle, Eco-VAS allows the development manager to examine, alter and therefore reduce a vehicle’s environmental impact from the initial stages of development right through to its eventual disposal. Using such calculations during its development, the fourth-generation Prius is predicted to generate a total environmental impact that is 45% less than that of an equivalent Toyota model with a 2.0-litre petrol engine. Meanwhile, the latest Prius Plug-in produces 21% less CO2 than its predecessor when in use, and up to 77% less if the energy charging its battery comes from a renewable source. In terms of its entire life cycle, the new model produces 5% less CO2 and up to 36% less when charged with renewable energy. Toyota is also developing and expanding the use of materials with lower CO2 emissions, as well as reducing the quantity of materials and number of parts used in each vehicle. More recycled and biological materials are being adopted all the time, and initiatives are being put in place to simplify construction so each vehicle can be more easily dismantled.